It’s officially the first day of the fall season. As you begin to wind down from your fun summer vacations, fall is a great time to focus on health and wellness, and enter a fun contest to win fantastic prizes! Who doesn’t love a good scavenger hunt? But this one has a twist – it will be held virtually, via Twitter! Why: To celebrate fall and win great prizes! Starting October 3rd, we will post a clue to something you can easily find by searching the Internet. Follow the #IINHunt tag where clues will be posted every weekday at 2:00pm EDT. Topics will include health, wellness, autumn, IIN, and more fun stuff you love! Remember to include the #IINHunt in your answer to be eligible for your points. We’ll keep track of the score throughout the month and let you know who’s in the lead. At the end of October, the person with the most points wins! We have cool prizes for the runners-up, too! 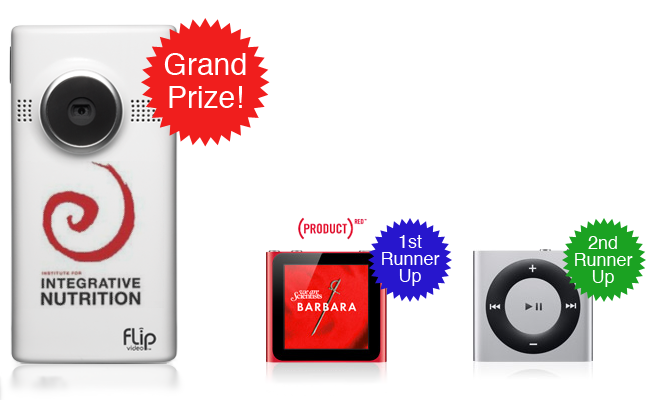 First Runner Up: An iPod Nano with the exclusive Apple store color. All proceeds go to Global Fund to Fight AIDS in Africa! We can’t wait for the Integrative Nutrition Scavenger Hunt to begin! But in the meantime, make sure you are following us on twitter. (@NutritionSchool) Clues will be posted promptly at 2pm EDT everyday, so you don’t want to miss out!